This is all about the Top 5 features of Windows 10. Just a few days ago Microsoft shocked the whole world announcing Windows 10, which was actually expected to be Windows 9 and many people registered their blogs with domains containing the keyword ‘Windows 9’. So, two minutes of silence for them. Ohh, the time is over. Let’s get into the deep and explore the Top 5 features of Windows 10. As soon as it was announced and there was a chance to become an Insider to test drive the latest and the best Windows ever, as claimed by Microsoft I registered as an insider. And as soon as I finished downloading I installed it and hoped to get thrilled by what I see in the next Windows and it actually did amaze me. Here, I will mostly speak about the Top 5 features of Windows 10, which have already been announced and are brilliant & appreciable and I can bet that if you are a serious Windows user you will definitely love it. So, let’s start with it. In our Top 5 list of features on Windows 10, this should definitely be the first one and the most popular one. The first thing you will notice when you log in, is the old Start Menu icon at the bottom left corner. 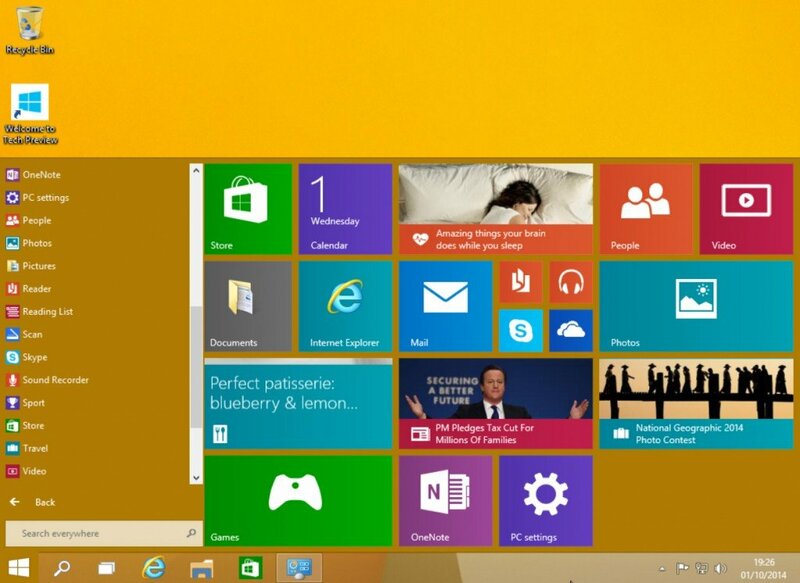 Yes, the Start Menu is back with a new design. We all hated when Microsoft removed the Start menu in Windows 8 and Microsoft had to pay a price for such insanity. Hopefully, Microsoft brought it back this time on Windows 10. This time, the Start menu is completely different from what it used to be in the pat all versions of Windows. Here, as you can see the apps are also present along with the Start menu items. You can move, resize, add live tiles to Start and also enjoy the old, conventional Start Menu. I’m just loving this awesome idea. It helps me find out programs easily and also I can switch to my favorite apps, which I have pinned in the Start Menu. Also, the search function at the Start menu is back. And the power button has also been relocated at a good space right at the Start menu, beside the ‘User’ alongside the standard app list. This is something great, if you don’t know yet what is this thing, sit back, relax and read. This is some kind of feature which is very interesting and useful for multi-tasking. Till now, we could open windows side by side, but now you can snap up to four windows and this can reduce time while switching between windows during multi-tasking. This was available in OS X, but now you can enjoy this great feature on Windows 10. Also, there are more in the new Windows 10. For a more personalized experience you can now create more than one desktop for different people and different purposes and switch between them efficiently. 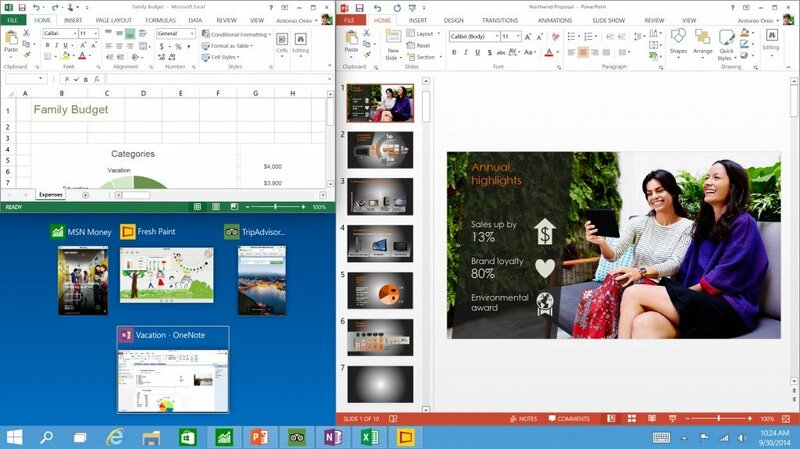 Microsoft has finally solved the controversy over modern apps/metro apps vs desktop apps. Many users find it difficult to switch between the two modes, but now you will be able to run the metro apps which will have a close button at the top right. Also, you can use the snap feature and run traditional apps and metro apps, side by side. Also, there is a great feature for programmers who use command prompt very often. Yaah, that is one of the best feature I have experienced till now. Now I don’t need to input long path names, just I can use ctrl+c and ctrl+v instead of the old lengthy process. Moving along in our Top 5 features of Windows 10 list, here is the last one. Microsoft is trying to make a big shout out by calling it the ‘greatest enterprise platform’ on Windows and according to them, enterprise users will now be able to manage data efficiently and in a more secure manner. Also, Microsoft has announced Universal App Store, under which developers will now be able to create universal apps which will run on PCs running Windows 10, tablets and even on smartphones. That seems like a pretty good idea. So, here was our article on Top 5 features of Windows 10. In Windows 10 all these things looks quite promising. Though the Technical Preview version is not fully perfect but it is way better than Windows 8 or 8.1. Hope that when Windows 10 hits the market, it will be as popular as Windows 7 and Microsoft will able to smash criticism from the Apple community. 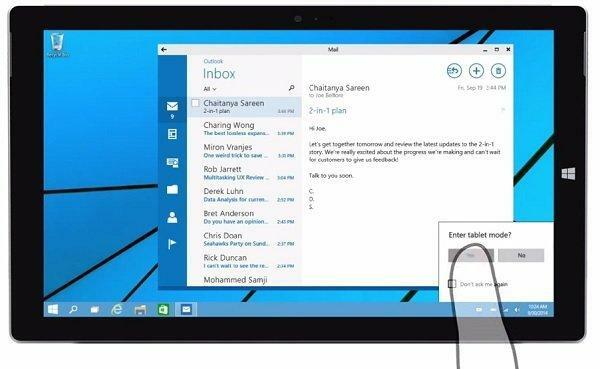 Get the Windows 10 Technical Preview here. Check out our other Top 5 posts here.